Minitrack’ at Blossom Point — Developed by NRL to track the Vanguard satellite, Minitrack (Minimum Trackable Satellite) incorporated NRL’s phase-comparison and angle-tracking techniques and utilized a series of fan-shaped vertical antenna beams forming a “fence.” The antennas are seen as rectangular-shaped objects on the field. The system comprised a chain of stations extending from Blossom Point, Maryland, to Santiago, Chile, with additional stations at San Diego, California, Australia and South Africa. The data collected by these stations, telemetered from the Vanguard satellite, were transmitted to NRL’s Control Center in Washington, D.C. The Blossom Point station was also used in NRL’s demonstration to prove the feasibility of tracking non-radiating satellites, which led to NRL’s development of the U.S. Naval Space Surveillance System (NAVSPASUR). Image Credit: U.S. Naval Research Laboratory. June 14, 2016 – In 1941, the National Bureau of Standards (NBS) leased the southern portion of Cedar Point Neck, located in southern Maryland, from the Catholic Church for fuze and ordnance testing. 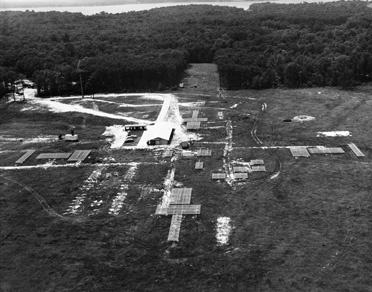 Originally known as the Blossom Point Proving Ground, the facility was renamed the Diamond Ordnance Fuze Laboratory Test Area after the NBS Ordnance Development Division was transferred to the Department of the Army in 1953. In May 1956, the Department of the Navy (DoN) was granted a permit to use 23 acres of the Army facility for project Vanguard — a program initiated to represent the United States in the International Geophysical Year (IGY) and the first American satellite program — as a communications tracking station for satellites. Located 35 miles south of Washington, D.C., the site was selected based primarily on its isolation from noise and electronic interference, and was named the Naval Research Laboratory (NRL) Cedar Point Neck Site, Blossom Point Research Facility. By July 1956, the Blossom Point station went into operation and was soon employed as training and testing headquarters for the first satellite tracking system, the ‘Minimum Trackable Satellite,’ or Minitrack, based on a proposal by NRL researchers John T. Mengel and Roger L. Easton, who had also co-authored the project Vanguard proposal with NRL electronics engineer, Milton W. Rosen. In October 1957 the Minitrack receivers were quickly modified to track the first man-made orbiting satellite, Sputnik I, launched by the Soviet Union, making NRL the first to demonstrate the feasibility of a radio detection and tracking system for earth-orbiting non-radiating [dark] satellites. The Vanguard I satellite was later successfully launched into orbit, March 17, 1958, and although not the first U.S. satellite launched into orbit, it remains the oldest still orbiting Earth. Based on the results obtained from Blossom Point, NRL proposed a satellite-surveillance system for the United States, and was responsible for the development of the world’s first space surveillance (SPASUR) system to detect and track all types of earth-orbiting satellites, space vehicles, and other orbital objects/debris. Sixty years later, the site is known as the Blossom Point Tracking Facility (BPTF) and has undergone a series of evolutions that have culminated in it becoming a state-of-the-art command and control facility, capable of supporting “launch through end-of-mission life” operations. The foundation for this broad range of capabilities is the NRL-developed and government owned, Neptune Common Ground Architecture (CGA) software system. Neptune/CGA is government off-the-shelf (GOTS) software developed by NRL to provide a command and control software suite capable of spaceflight support services for automated testing and qualification of space flight articles; intelligent automation of on-orbit assets with minimal staffing or in ‘lights-out’ operation; contact execution and pre-defined autonomous anomaly response and configuration; monitoring and reporting of the space and ground status and tracking, telemetry, and operation and control of satellites; receiving satellite data transmissions; and monitoring satellite health and data quality. NRL has optimized the hardware and software architectures over many years to maximize flexibility in integrating new spacecraft programs and ground systems with minimal financial and time impacts. To date, Neptune/CGA has contributed to the successful launch and mission operations of more than 25 satellite systems that comprise more than 80 different spacecraft. Today the BPTF 42-acre campus consists of a satellite mission operations center, multiple antennas, and an existing infrastructure capable of providing space system command, control, and management for all customer classes in every orbit regime. The facility is in continuous operation 24 hours a day, 7 days per week, and at present supports numerous on-orbit spacecraft. BPTF provides engineering and operational support to several complex space systems for the Navy and other users, enabling cost-effective solutions for all programs. The tracking facility provides direct line-of-sight, two-way communications services with spacecraft in multiple bands during all mission phases, including concept, mission, and space segment development, launch, early on-orbit operations, and mission data collection. Additionally, BPTF’s capabilities allow coverage through connectivity to worldwide ground station networks. There are currently 11 satellite antennas supporting every orbit regime. Power is supplied by two uninterruptable power supplies (UPSs) rated at 125 kilowatts (kW). Emergency power is supplied by a set of redundant emergency generators rated at 1 MegaWatt (MW). The entire system is operated by computers 24 hours every day.